But now it seems she's moved onto something else. Never ask me to dogsit your precious pooch because as past experience will show, I am definitely no dog whisperer. I swear I was only talking on the phone for 5 minutes. Next thing, I found Molly inside the off limits house, snoozing on the off limits leather couch cradling the off, off, off limits iPad. It could have gone so wrong if I had not found her when I did. I just hope she doesn't have an online gambling problem. And speaking of dogs I have to tell you about the clever Labrador I came across on my road trip. As I was booking into a Motel one evening I noticed a black Labrador sitting just outside the office. As the Receptionist told me my room number and handed me the key I noticed the dog walk off. Then as I parked the car outside the room I noticed the Labrador sitting at the front door. As I walked towards the door he came over to me, nodded his head and walked off. I later mentioned this to the Receptionist and she said he does the same with all the guests. He hears her tell them the room number and then he goes to the room and waits at the door until the guest arrives. So even though Molly clearly surfs the net in her downtime do you really think that dogs can understand and read room numbers? Looks like Molly needs an iBone....couldn't resist, ha ha. LOL! I do believe they understand what we say, but numbers?? No. This is interesting...hmm. There must be some trick to this. Don't think so - it was strange alright but the dog was waiting at the room door and left when I arrived. Smart Dog! I wonder if she's ever tried to trick the dog and give a room number that doesn't exist. Hehe. Not sure. I am not sure I totally believed it either but it was so very strange. I believe that dogs and cats and other Animals, too, understand a lot more than we give them credit for....! I find that such a wonderful story---and how the dog knows really doesn't matter---But, He/She does! What a delightful greeting! And Molly---I LOVE that she LOVES the iPad....lol! Thanks Naomi - it was a delightful greeting. Best I have had lol. My dog loves my iPad, I guess pets wonder what the fuss is all about. As for dogs knowing room numbers well I have no idea. I guess they can be trained. After all look at what seeing eye dogs do every day - it's remarkable really how smart some dogs (not all clearly) are. Hey did you notice that Australia is second to China on the Paralympics medal tally? I believe your dog had special powers Vicky - I loved reading about him. I bet your new puppy will be exactly the same. It's about time, we need more dogs on the internet it's being overrun by cats. 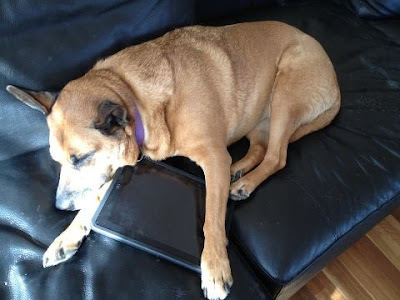 That's a funny picture of the dog and ipad. Yep, more dogs I say too. I've heard of dogs learning to spell, so I wouldn't put it past that dog. Dogs spell? Clearly I have a lot to learn about man's four legged friends. It's down right scary, a black killer that can read and understand... with that sharp hearing, one can't even whisper! 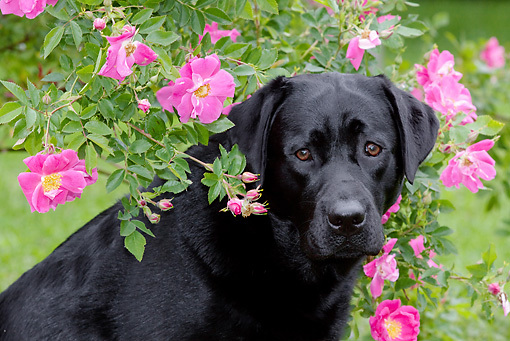 Is this the genius black Lab? That is pretty darn amazing. I'll bet all the dogs love you. Err no Kay, just ask my brother's dog Rosie. I am scared of her and she knows it..
Oh, how funny. At least it looks like the dog makes sure that visitors get into their room safe and sound, eh? I know, it was very surreal.